Man Utd secured a 2-1 win over Leicester City in their Premier League opener on Friday night, but Jose Mourinho didn’t get the chance to make his desired changes. The Red Devils opened up a two-goal lead through an early Paul Pogba penalty and a late Luke Shaw goal, although they did have to hang on in the latter stages after Jamie Vardy struck from off the bench. However, they secured three points to get up and running this season, although Mourinho has conceded that he wasn’t able to make the substitutions that he wanted. With Paul Pogba only returning to training earlier this week after his World Cup exploits, coupled with summer signing Fred adapting to the tempo and demands of Premier League football, both were replaced in the second half to help Man Utd shore things up in midfield and protect their lead. 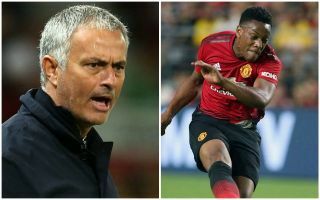 Mourinho though has insisted that he wanted to bring Anthony Martial on, but wasn’t able to as he could see the energy draining out of his midfield at a crucial time in the game. “I wanted to play Martial in a certain minute, in a certain moment I felt that he was perfect to stretch the game and to get them in the counter,” he is quoted as saying by the Metro. “But I was afraid to play him because I knew that Paul couldn’t resist for 90 and Fred would be in trouble. Who was Man Utd's MOTM against Leicester? That will likely be music to the ears of the Frenchman, as he has reportedly faced a difficult summer in which his future at Old Trafford has continued to be questioned, as per The Guardian. In truth, Mourinho is merely outlining a sensible strategy as Martial’s presence on the counter-attack could certainly have made the game more comfortable with Alexis Sanchez and Romelu Lukaku spurning late opportunities. However, he’ll hope that he can have an impact moving forward and silence talk of an exit by proving his worth to the Portuguese tactician.